The first three will be discussed in this section, but acute epiglottitis, because of its potentially life-threatening nature, will be discussed separately. The croup syndromes has a characteristic sequence of events and clinical presentation caused by progressive edema of the airway. Generally, the onset of a mild, brassy, barky cough - often described as "barking like a seal" - is preceded by rhinorrhea and sniffles for 1-2 days. Intermittent respiratory stridor then occurs (SOUND). As obstruction increases, the stridor increases, actually becoming continuous, with associated hypoventilation, hypercapnea, and hypoxia. The respiratory distress is quite notable with dyspnea, intercostal retractions, nasal flaring, and tracheal tugging. The child becomes quite agitated with increased crying, which worsens the existing symptoms. The child may eventually become lethargic, which heralds impending respiratory failure, if it has been allowed to progress this far. Thus, it is important to understand the progression of these symptoms so as to intervene in the early stages. It is also important to note that not every child will progress to complete obstruction. Happily, most have only minimal amounts of obstruction and mild symptoms. Acute laryngotracheobronchitis, also known as viral croup, or simply croup, is the most common of the clinical entities seen in pediatric practice. Viral croup is usually seen in patients ages 3 months to 5 years. It is caused by respiratory viruses mainly parainfluenza type 1 (DISCUSSION), but also parainfluenza type 3, influenza A, adenovirus, respiratory syncytial virus, echovirus, and mycoplasma. Males are affected more often than females. The diagnosis is based on history and physical examination, but it can be difficult occasionally, especially if the symptoms are severe and mimic the appearance of acute epiglottitis. If the diagnosis of epiglottitis is a possibility, the patient should be managed as if he or she does have epiglottitis. Endolateral neck x-rays can be very helpful and have a characteristic appearance. On the anteroposterior or AP view there is distention of the hypopharynx with symmetric subglottic narrowing in the first 1-2 cm of the trachea. This is also known as the steeple sign because it resembles a church spire. The lateral view may show subglottic narrowing or loss of the air shadow. The complete blood count or CBC is generally unremarkable except for a lymphocytosis. Bronchoscopy would show mild subglottic edema. Treatment depends on the severity of the disease. Mild illness can be easily treated at home with conscientious parental monitoring, but specific instructions must be thoroughly discussed with the parents including cause, treatment, and symptoms of respiratory distress (DISCUSSION). A child should be hospitalized if he or she appears toxic or has progressive stridor, cyanosis, or mental status changes (SUMMARY)(SOUND). Either way, the first principle is to provide humidification by a cool-mist humidifier or other means. In cooler weather or at night, taking the child outside may break the acute episode alone. The child should also receive adequate fluid either orally or intravenously. If hospitalized, monitoring for hypoxia is important. Pulse oximetry or arterial blood gas analysis also known as ABG can be used. If indicated by these methods or clinically, oxygen should be provided. Racemic epinephrine delivered by nebulizer improves air exchange and may eliminate the need for intubation. A child who receives racemic epinephrine should be monitored for at least 6-10 hours after the last treatment because of the possible risk of "rebound," ie, the child may improve for a few hours after treatment, but actually deteriorate to a more severe state later. The use of corticosteroids is controversial, although some data show early treatment with dexamethasone may shorten the course. The child should be monitored closely for deterioration of respiratory status, which correlates with increased airway obstruction. If his condition is deteriorating, the airway should be secured by endotracheal intubation . The child should not receive sedatives or opiates as these may depress the respiratory drive. Neither should expectorates or bronchodilators be used as these may irritate the airway and cause increased obstruction. Antibiotics do not cure the disease as it is viral in etiology (SUMMARY)(SOUND). The differential diagnosis of viral croup includes other members of the croup syndromes especially spasmotic croup, diphtheria, measles, retropharyngeal abscess, foreign body aspiration, extrinsic airway compression, intraluminal laryngeal obstruction such as cyst or tumor, congenital subglottic stenosis, angioedema, tetany, and asthma (SUMMARY). Complications are generally secondary to extension of the process including otitis media, pneumonia, and adenitis. Rarely, meningitis, mediastinal emphysema, or pneumothorax is seen (SUMMARY). Acute spasmotic laryngitis, also known as spasmotic croup, is similar to viral croup and may be a variant of it. Unlike viral croup, however, it is characterized by acute attacks of inspiratory stridor that occur at night and subside in a short time, only to recur in subsequent nights. The children are usually between 1 and 3 years of age. The cause is viral in most instances, but allergic and psychologic factors appear to play an important role in some children. The child usually is awakened from sleep with marked stridor and a harsh, barky, metallic cough. Cold-like symptoms, if present, are extremely mild, and fever is absent. 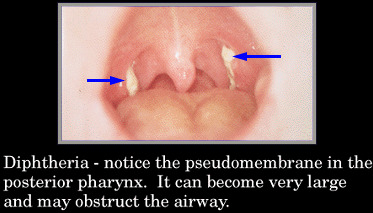 Examination of the pharynx reveals only minimal, if any, edema. Acute spasm of the vocal cord adductors may be the cause, possibly triggered by allergy, viral infection, or gastroesophageal reflux. Recurrent episodes during the night for several days is the general rule, but some nights may be skipped between attacks. Treatment at home by exposure to steam in the bathroom or to the cool night air is sufficient to break the attack. The child often arrives in the emergency room with surprised parents because the attack has been broken during the ride by the night air. Racemic epinephrine will break the attack if needed. Parents need accurate information and reassurance before discharging the patient home including written instructions such as those for viral croup (DISCUSSION). The major differential diagnosis is between spasmotic croup and viral croup. Complications are exceedingly rare. Acute infectious laryngitis is a common illness in all age groups and again is caused by viruses, especially influenza A (DISCUSSION), rhinovirus, and adenovirus. Diphtheria is a rare cause. The illness is generally quite mild with sore throat, hoarseness, cough, and possibly mild inspiratory stridor. Respiratory distress is rare with the exception of young infants. If diphtheria is the cause, respiratory distress with airway compromise is quite marked secondary to the pseudomembrane blocking the laryngeal inlet . Complete obstruction and respiratory arrest may occur. Fortunately, immunization for diphtheria in the United States has made this disease extremely rare. Diagnosis is made by history and physical examination. The physical examination may show some minor erythema and minimal edema of the supraglottic structures. Treatment includes resting the voice and inhalation of humidified air. Antibiotics are indicated if diphtheria is thought to be the cause. Children who present to the physician with the typical signs and symptoms of croup should be treated as if they have typical croup. But, if the child presents with atypical features of croup, such as recurrent episodes or a persistent episode despite adequate treatment, other causes must be sought. These include laryngeal or tracheal anomalies like congenital subglottic stenosis, webs, or cysts. If the child is younger than 12 months of age, these underlying causes must also be considered because, although croup can present as early as 3 months of age, it is more likely to occur in children over twelve months. Distinction between the various entities is important. Be suspicious of signs or symptoms that do not appear to be the routine case of croup. Careful education and instruction of the parents is critical to the adequate monitoring of the child who is to be discharged home. Most children have full recoveries with minimal intervention. References for the croup syndromes.